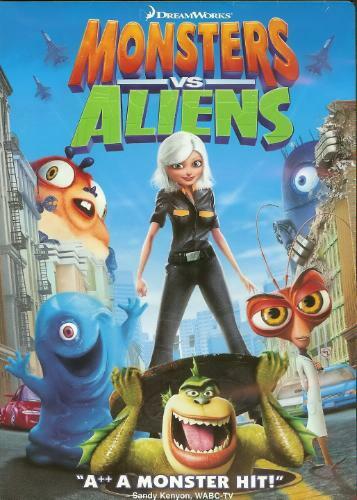 Monsters vs. Aliens wasn't quite as good as Shrek or Kung-Fu Panda, two other really good animated feature films by Dreamworks, but it was still enjoyable, and looked really cool seeing it in true 3D on the big screen. The DVD treatment lost the 3D edge that the movie had, but I'm completely fine with that since home 3D with the red and blue glasses never seemed to work for me anyway. The companion disc to Monsters vs. Aliens contains the thirteen minute animated short Bob's Big Break, which is presented both normally and in 3D, and as usual I was barely able to see the 3D effects, and definitely not worth watching it with those uncomfortable and annoying glasses. So I'll pass on home 3D until they start selling televisions specially equipped for it. The movie didn't seem quite as developed, story-wise, as the previously mentioned Shrek and Kung Fu Panda. It starts out with a lovely young woman named Susan Murphy who is about to marry a guy whom she thinks is the man of her dreams. Unfortunately, before the wedding can begin, she is struck by a meteorite, causing her to grown into a 50 foot tall woman shortly thereafter. Before Susan can figure out what's going on, she is kidnapped by the government and taken to a secret underground facility commanded by General W.R. Monger. So General Monger basically just takes Susan and plops her in a essentially blank room where she will supposedly spend the rest of her life simply because the government says so. I really didn't like this part... it just felt wrong for some reason. I think they should have tried to convince her to stay for the safety of others, or said that they would work hard to get her back to normal, or something like that. The way they did it just didn't feel natural. I mean, they didn't even bother to clue her in to the other monsters, she had to find out about them by meeting them on her own when it was feeding time. Sure, the awkwardness of meeting them was slightly funny, but surely they could have done some funny official introductions. At this point, we don't really know what the plot or goal happens to be. Where are we going from here? The story felt like it hit a stop, and must now be started up again with some other event. And that event comes in the form of a giant space ship that eventually transforms into a robot and starts attacking San Francisco. With the military unable to even slow the thing down, General Monger suggests that the monsters be released to fight the alien robot, and the monsters agree in exchange for their freedom. This is where we get the first battle between the monsters and aliens... actually, this is where we get the first real action sequence at all. Initially, I was expecting each of the monsters to attempt stopping the robot individually, so that when they all failed they would realize that they have to work together as a team... but I was dead wrong. They started working as a team from the get-go, and did a fairly good job of battle the big metal baddie, considering they had never really trained for anything like that before. So now the monsters are free, just like that, after all those years. Er, now what? Susan has a family to go to and her fiancee, but what about the other monsters? They don't really have anybody or anything. Seems like they should have had something to at least try to go back to, even if they went and found that everything was different and they didn't fit in or something like that. Or perhaps they could have gone of to try things they've always wanted to do. You know, something more than simply being freed and that's it. Yeah, the plot just didn't seem to flow for me, but it was still enjoyable and I liked that I couldn't even guess as to where it was going. The cast of characters worked really well, and I think they could do really well with a sequel if they can put together a great story. We actually get to see a bit more interaction of the monsters, minus Susan, in the animated short B.O.B. 's Big Break , which chronologically takes place many years prior to the start of the feature film. Here, Dr. Cockroach has a plan to turn the gelatinous B.O.B. into a mega-bomb to blast them all to freedom, but something goes wrong and instead B.O.B. gains the ability to speak the thoughts of anyone who is touching him. So Dr. Cockroach and The Missing Link use this to attempt a different escape attempt by getting General Monger to think about the flaws in security. And it all goes pretty good until B.O.B. starts hitting their escape craft like it was a pinata, causing it to crash and burn, and thus losing his ability in the resulting explosion. The animated short is a cute little time waster, but nothing specifically exceptional. There's not much tension built or emotions felt, much like the feature film. It was a decent movie with some fun characters, so I'd say it's worth renting.